Selected by the Cleveland Cavaliers, Duke Blue Devil Kyrie Irving will be leaned on to help offset the loss of Lebron James. The Cleveland Cavaliers selected Kyrie Irving with the No. 1 pick in the NBA draft Thursday. 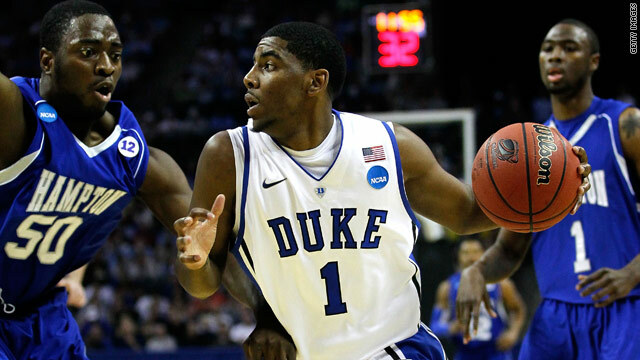 Irving, who averaged 17.7 points a game in his only season with the Duke Blue Devils, is from West Orange, New Jersey. He played in 11 games last season, scoring in double figures each time and averaging 4.3 assists and 3.4 rebounds, before being sidelined with a toe injury. The last time the Cavaliers had the No. 1 pick in the draft they selected Lebron James in 2003. See Sports Illustrated for complete draft results. If you can't stop checking online to see what's popping, you may be losing gray matter and the ability to read people's faces, studies show. Constant Internet stimulation may change the physiology of the brain and make it difficult to live in the slower "real world." Many CNN.com readers pointed out the irony of having to read the story on the Internet. Some were skeptical of the research. CleaverName said, "This could be true or not. Plos One is an OK journal with an impact factor of 4.3. The study involved only 18 people (not a great population size). Go and actually read the paper, their conclusions are not that strong." 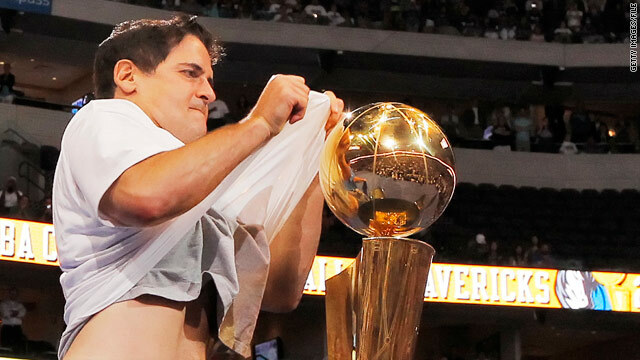 Mark Cuban polishes the championship trophy during a celebration after the Dallas Mavericks' victory parade. The oft-outspoken owner of the Dal - er, sorry - "the World Champion Dallas Mavericks" has never shied away from confrontation, so no one should expect that he would have quietly accepted Ross Perot Jr.'s allegations. As is his trademark, Mark Cuban took it a step further. Last year, Perot, who in 2000 sold a controlling interest in the club to Cuban for $285 million, filed suit to have Cuban removed as the team's owner. Perot, son of the billionaire businessman by the same name, claimed that the Mavs were losing money and were the "worst franchise" in sports, according to CNN affiliate KDAF-TV. Well, the Mavs actually turned out to be the best franchise in basketball this year when they trounced the heavily favored Miami Heat in six games this month. Dirk Nowitzki & Co. did their talking on the court; now, Cuban's attorney is talking in the court, filing a motion for summary judgment to have Perot's case thrown out. Filed under: Basketball • Courts • NBA • Sports • Texas • U.S.
Jim Riggleman, who took the Nationals job in 2009, has an overall record of 662-824 in 12 years as a big league manager. 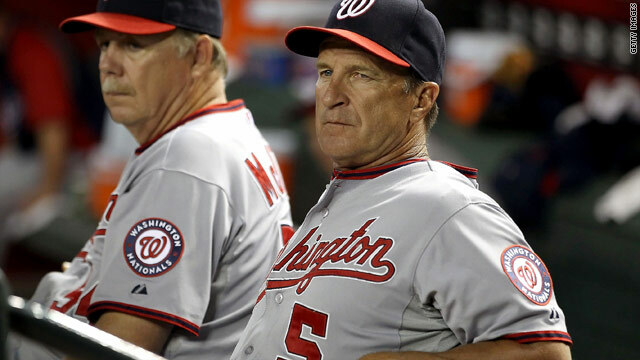 Jim Riggleman has resigned as manager of the Washington Nationals over contract issues, the team said Thursday on its website. Quoting Riggleman's manager Burt Rocks, the team said Riggleman was upset the ballclub "didn't pick up the option year in his contract." Riggleman's departure marks the second time this week a National League East manager has stepped down. Marlins manager Edwin Rodriguez resigned Sunday after his team lost 17 of its first 18 games in June. Riggleman leaves Washington during a hot streak. The third-place Nationals were 11 -1 in their last 12 games and one game over .500, beating the Mariners 1-0 Thursday. An interim manager has not been named, the Nationals said. Kemba Walker was a stud at UConn, but one SI analyst questions whether he can be a powerhouse in the NBA. With just hours before the 2011 NBA Draft kicks off in New Jersey's Prudential Center, speculation continues about the fate of this year's class. Will Jimmer Fredette experience a major falloff in the pros? 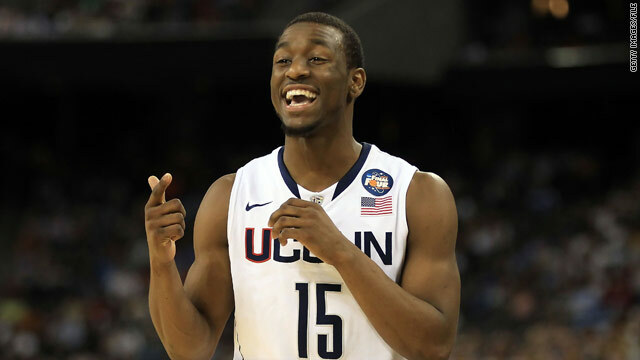 Will Kemba Walker be able to mold his skill set into one that is valuable in the NBA? - "Kyrie Irving, 6-4 freshman point guard, Duke. Just a great kid. He has only an 11-game body of work, but he has an incredible ability to get in the lane. He's a pass-first point guard, but he can also score. He's not a freak athletically like Derrick Rose or Russell Westbrook. His game is more of the Chris Paul variety, but I don't know if he'll be that good. His lateral mobility is probably his biggest question." Filed under: Baseball • Basketball • NBA • New Jersey • Soccer • Sports • U.S.
A rhesus monkey similar to this one is missing from an Atlanta research center, Emory University says. A rhesus monkey has been missing from its compound at an Atlanta primate research center for more than a week, the center said. Emory University's Yerkes National Center on Primate Research said in a news release that its staff members have searched areas of the compound that might be familiar to the monkey, as well as other areas nearby. The monkey has been missing since June 15. "Yerkes personnel are continuing to search for the monkey," the announcement said. 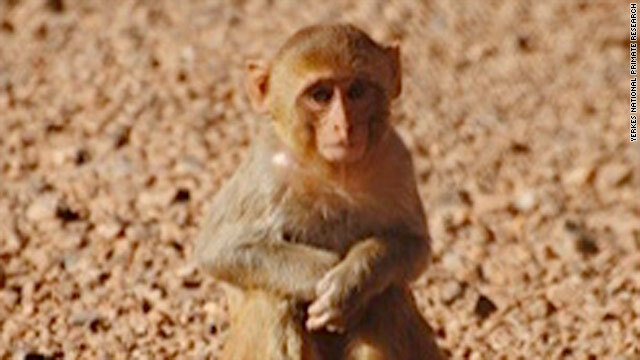 Though rhesus monkeys often carry the herpes B virus, the Yerkes statement said this particular monkey was bred at the center for behavioral study. Filed under: Animals • Georgia • Monkeys • Science • U.S.
A man boards an airplane wearing women’s underwear and a small sweater. Airline travel isn't what it used to be. Besides pat-downs, ash clouds and pilot rants, you now may have to face passengers in revealing bikinis. Or maybe you'll find a superstar rapper onboard who feel the need to steal the mic. And there's always those interesting safety videos. You've gotta watch these airline antics. Filed under: Air travel • Gotta Watch • Security • Transportation Security Administration • Travel • U.S.
Actress Lindsay Lohan is set to return to court Thursday for a probation violation hearing, a source close to the case says. 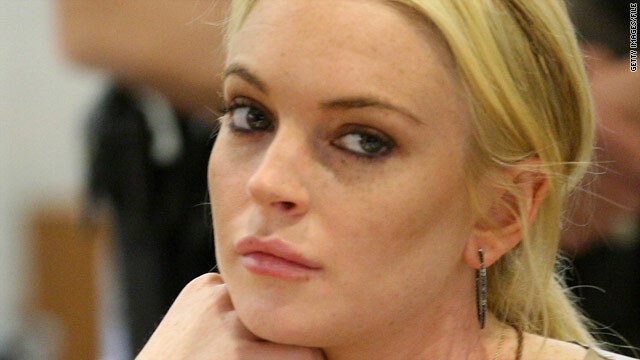 Lindsay Lohan ordered back to court - Lindsay Lohan allegedly failed a court-ordered alcohol test last week and will have to go before a judge for a probation violation hearing Thursday morning, according to a source close to the case. Lohan's failed test comes while the actress is confined to her Venice Beach, California, home after pleading guilty to stealing a necklace. The actress will appear before Los Angeles County Superior Court Judge Stephanie Sautner, the same judge who sentenced her, a prosecution spokeswoman said. Fugitive captured - Accused Boston crime boss James "Whitey" Bulger is expected to be arraigned Thursday in Los Angeles. Bulger was arrested Wednesday by the FBI Fugitive Task Force in Santa Monica, California, according to FBI spokeswoman Laura Eimiller. Bulger had been on the run since the mid-'90s after fleeing Boston as he was about to be arrested in connection with 19 killings, racketeering and other crimes. Bulger, 81, has been the subject of several books and was said to be the inspiration for the 2006 movie "The Departed." 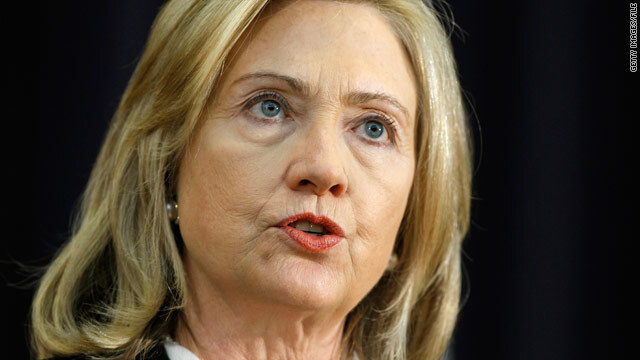 Secretary of State Hillary Clinton will discuss the president's planned troop drawdown before a congressional committee. How is President Obama's plan for a troop drawdown in Afghanistan resonating on Capitol Hill and around the world? Watch CNN.com Live for the latest on this developing story.